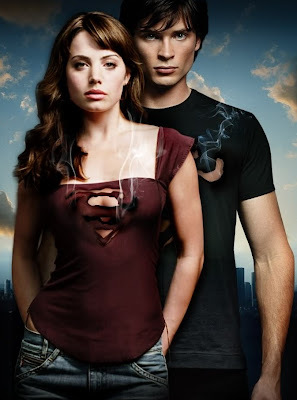 I'm doing the Starpulse recaps for the tenth season of SMALLVILLE, a show that started out okay, got stronger, then lost its steam as its success forced the overlong delay of bringing the story to its foregone conclusion. When SMALLVILLE premiered in 2001, the concept of a young Clark Kent discovering his nascent powers and learning of his Kryptonian heritage was a novel take on the oft-visited character of Superman. Tom Welling’s sensitive masculinity was a perfect fit for the would-be Man of Steel and while the show took some time to find its voice, by the second season , it had blossomed into a solid addition to the Superman legacy . By the ninth season however, SMALLVILLE had overstayed its welcome, and not just because of the crippling loss of Michael Rosenbaum as Lex Luthor in season 7. From the outset, SMALLVILLE was a finite story, the ending of which everyone knows: Clark Kent becomes a reporter for the Metropolis Daily Planet and dons the red, blue and yellow costume of Superman . Since Clark was a junior in high school when the show started, that left about six years worth of stories to tell, including the opportunity to deal with Clark’s college years, something rarely tackled in any medium (aside from the best-forgotten syndicated ‘80s SUPERBOY series). But despite a show-guiding edict of “no flights, no tights,” the producers quickly began to prematurely integrate elements of SuperMAN’s world. The first danger sign came when Metropolis was transplanted from its traditional east coast locale to Kansas, within spitting distance of the Kent farm. By the fourth season, Lois Lane was on board. In season 5 , Clark met fellow DC Comics heroes Aquaman , Cyborg and Impulse (many more have followed, including series regular Green Arrow ). Soon characters were getting married and, astoundingly, most seemed to breeze through college in about a year, with barely a nod to that most transitional stage of life. Season 7 introduced Clark’s Kryptonian cousin Kara, aka Supergirl , and by the 8th season , Clark and Lois were working alongside each other at the Daily Planet . The problem is that after nine years, Clark Kent is an adult (Welling is 32! ), and while our hero (known as “the Blur” due to his super-speed obscured presence) sports a black trenchcoat covering a silver “S” shield T-shirt, he’s still not Superman. While earlier seasons had Clark struggle with what he thought was a despotic Kryptonian destiny, by now, especially with so many other superheroes around, Clark should be Superman. He’s supposed to be an inspiration, not a derivation. By dragging out the story, SMALLVILLE had become kryptonite to the spirit of the character of Superman. Now that they've come to the final season, the march towards finally putting Clark Kent into the Superman suit is under way. Darkseid is going to be the major villain, attempting to keep Clark from fully coming into the light (and bringing the rest of the Justice Leaguers and Society members along with him). I'm not going to post the full Starpulse recaps on Pops, but here are the links for the first two recaps (obviously laden with spoilers).